Design Universe Fill&Sign makes it possible to digitally sign PDFs or other documents on a Tablet PC or signature pad or with a mouse. Design Universe has developed electronic signature software that enables users to digitally sign PDF documents. 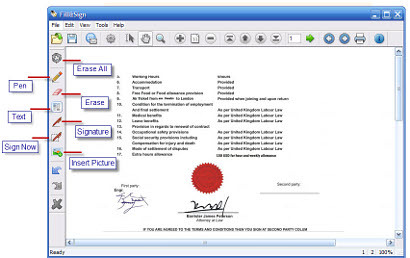 With Fill&Sign you can easily and securely capture a legal signature for your electronic document using a Tablet PC or digital pad and save the signed documents as PDF. With digital signature software every business can easily exchange signed documents electronically. These documents have a legal signature and are thus as binding and valid as normal paper documents. The biometric identifying data are stored invisibly and encrypted in the PDF document, and can be used to validate the integrity of the document. Any changes to the document after signing reveal a mismatch with the biometric data, and the document can be considered invalid. Since the biometrics are encrypted, they cannot be copied or modified. Adobe's PDF has evolved as the quasi-standard for electronic documents. Because of its widespread usage, it can be displayed and created with almost every computer. Many applications have built-in PDF capabilities. Fill&Sign adds even more benefits to this standard: You can now put a legal signature on PDF documents in no time. This is particularly important for sales people who can seal their deals without having to print the contract on paper. Insurance companies, government agencies and other companies and institutions can now exchange important signed documents a lot faster. Needless to say, Fill&Sign not only dramatically speeds your workflow, but also saves media costs. Your business does not have to waste time and money with printing, scanning or even sending documents via postal mail. Fill&Sign adheres to European and US laws and legal frameworks for electronic signatures. Documents signed with Design Universe Fill&Sign have a legal signature and a time stamp. Thus they are also in compliance with the Sarbanes-Oxley Act which imposes requirements regarding security, validity and reliability of documents on companies. 1. Simply sign a document on your Tablet PC or digital pad. 2. Instead of printing-out on paper, it creates a PDF document with the signature and biometric data embedded. 3. You can save, send as email attachment or print the PDF as you would with any other electronic document. With a few clicks of the mouse your documents are "locked in time" and saved as secure, digital Adobe Acrobat PDF files that look exactly like their paper print-outs when viewed on the screen. Acrobat files can be easily emailed or saved to your hard drive or removable media. Faster workflow: legally sign an electronic document without having to print it on paper, then scan it back into your document management system. Media cost reduction: by reducing or eliminating printing and scanning, you save on paper, ink and, most importantly, time. Mobility: since you are no longer fettered by reams of paper and stacks printing equipment, your highly mobile Tablet PC frees you to better and more quickly serve your customers. Directly email the signed document. When you sign a PDF document with Fill&Sign, just click on the Email button and send the document with the electronic signature directly to your colleagues or partners. Draw Signature Fields anywhere in the document. You can add signature fields to documents already in use. It is also possible to sign the PDF more than once (for example to sign multiple paragraphs etc.). Multiple legal electronic signatures - Usually more than one person has to put his or her signature on a document. Fill&Sign lets you sign PDF documents by multiple persons. Each electronic signature is legally binding. Comment and edit - Fill&Sign lets you add comments or changes directly in the PDF document. You can either write comments with your pen on the Tablet or type them conveniently on the keyboard.. Put a legal signature on an electronic document without having to print it on paper and scan it back into your document management system. Sign PDF documents electronically with Design Universe Fill&Sign and do not lose anymore time and money!